Bluegrass Pundit: Guess which former democratic presidential nominee is back to chasing ambulances. Guess which former democratic presidential nominee is back to chasing ambulances. 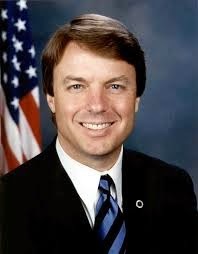 If you guessed John Edwards, you are correct. Edwards’ new firm, Edwards Kirby, based in Raleigh with an office in Washington, is pursuing customers with all the zeal of a late-night, local-cable informercial. Its website – call 1 (866) 409-2250 — is dominated by the words: “…AND JUSTICE FOR ALL” and outlines the firm’s expertise in personal injury litigation. Edwards has scored some of his biggest wins in medical malpractice suits; indeed, he was once so successful that he was accused of driving entire fields of medical specialists out of North Carolina and sending insurance rates through the roof. The new Edwards Kirby firm is looking for the same type of business. “Whether your case involves birth injuries caused in the delivery room, botched surgery or a missed diagnosis, the medical malpractice lawyers at Edwards Kirby can advise and represent you,” the website says. The return of "The Breck Girl."